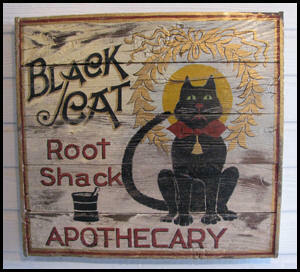 You are at the Lucky Black Cat Hoodoo & Root Shack Home Page. You can also shop for Lucky Mojo Hoodoo Occult Oils and other Magical Occult Oils and Potions at our eBay store, or you can look at our various Lucky Mojo Dressing Powders and Self Lighting Incense Powders from Lucky Mojo. Hoodoo is also known as Hoo Doo (but not Voodoo) and you can find an excellent selection of our Lucky Mojo Herbs, Roots & Curios at our eBay store blackcat-rootshack. Are you looking for a complete solution or kit? Then consider our Lucky Mojo Spell Kits, Bottle Spells and Honey Jars. Looking for something we don't carry then view our favorite list of products at Lucky Mojo Occult Co. and purchase directly from them. Do you live in the Dallas Area? Would you like to purchase Hoodoo, Conjure or Rootwork Supplies near Dallas? Then please come visit Dallas Hoodoo Drug Store in Sachse Texas, just north of Garland Texas. Many people know of the importance of keeping their house and place of business spiritually clean as well as the value of doing the same for their daily items and surroundings. But far too often folk overlook themselves! How can you go out and about Sanctified, Protected, and Blessed, ready and expecting all the good things you deserve when you yourself are still carrying an Evil Mess or an Oppressive Condition on your very self? Those older folk who remember know just how to get the right result with a good old fashion Spiritual Bath and we offer to you a fine selection of Herbal Baths, Bath Crystals, and Washes prepared the right way for the right results. A little warm water, two candles, and the Power of Prayer and you’re good to go - Clean and Ready. We make no claims as to the supremacy of Spiritual Baths in troubling matters and times but merely report what we have been taught and sell these beautifully blended baths as a curio only. Don’t let bad, ill, ugly orders spoil your Success, Love, Happiness and Good Fortune. Folks, especially men, don’t like to come to a place that smells foul - But they love to stay on at a sweet, pleasant smelling place. Rid yourself of evil messes that can only drag down and clutter up the sanctuary of your home and business; where you should be surrounded by all the good things in life you deserve. We have been shown how a little water, a good broom or mop, the Power of Prayer and these finely formulated floor washes can ease the dark cloud that hangs over so many places of business and dwelling. Drive out those Evil, Bad Smelling odors from back to front and out into the street – goodbye! We make no claim as to the spiritual power of Prayer or these finely made floor washes and sell them as a curio only. Lucky Mojo Fiery Wall of Protection products are a powerful SHIELD against your enemies, those who wish to do you harm, and those who slander your good name! Do not let malicious spells or hostile intent harm yourself or your loved ones, use Lucky Mojo Fiery Wall of Protection products to STOP their attacks. Brought in chains but still a King! Here is the power of High John -- the laughter on the tongue, the strength in the muscle and the sharpness of the mind. To Defy, Overcome and grant that extra Masculine “something” we offer this fine line of HIGH JOHN products. Money Drawing is an old formula that is used to draw income. If you need to draw money to yourself or your family, this is the NUMBER ONE Hoodoo oil for that condition. Use this oil on yourself by anointing your hands, on your money to draw more, on Vigil Candles to bring in more money. These Lucky Mojo Uncrossing products are believed to bring an end to crossed conditions. Recently divorced, separated from an angry lover or fired unfairly? Use our Lucky Mojo Uncrossing products to restore your natural good fortune. If you are new to occult and wish to purchase only ONE authentic occult recipe then this is it. All purpose, prepared from Oriental grasses, this Lucky Mojo Van Van recipe is used to clear away evil, change bad luck, open new opportunities and dress amulets and charms. or visit us in-person at Dallas Hoodoo Drug Store. All content copyright Lucky Black Cat Hoodoo & Root Shack or Lucky Mojo Curio Co. - All rights reserved. 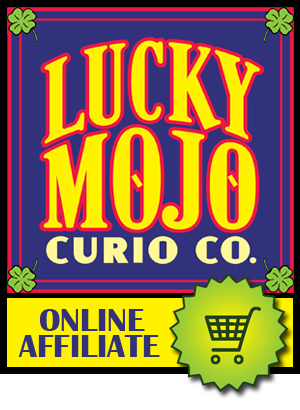 Lucky Black Cat Hoodoo & Root Shack is an AUTHORIZED reseller of Lucky Mojo Curio Co. Products. Lucky Mojo is the industry leader in quality Magical Hoodoo Spiritual Supplies. Our team of certified occult practitioners include graduates of the Hoodoo Rootwork Course by catherine yronwode. All custom items done in accordance with authentic rootwork blessings, prayers, and practices. Lucky Black Cat Hoodoo sells a wide variety of Lucky Mojo Brand Occult products, either in stock now or SOON to be listed. See our other listings for – Bath Crystals, Floor Washes, Sachet Powders, Condition Occult Oils, Incense Powders and more! Popular occult herbs, magical roots and conjure curios, either in stock now or SOON to be listed. See our store for: Devil's Shoe String, Angelica Root, Queen Elizabeth Root, Little John to Chew, Deer's Tongue, John the Conqueror, Hyssop, Master Root, Five Finger Grass, Devil Pod, Irish Moss, Black Walnut, Dragon's Blood, Alkanet, Balm of Gilead, Job's Tears, Blood Root, Calamus Root, Wahoo, Blue Flag, Bayberry and much much more.